Visiting Santa at Macy's in New York City is a wonderful way to celebrate the holiday season and create a special memory of your trip to New York City. It will come as no surprise that it's also a super popular place to visit Santa, so read our tips and advice to help make your visit easier, faster, and more pleasant. The department store recently changed the process so the updates will be helpful to enhance your experience at Santaland. If you are going on a weekend, you'll want to consider the Santa Express Lane Pass. In 2018, Santaland opened on November 23 and will be welcoming the young and the young-at-heart to visit their favorite jolly gift-giver until Christmas Eve, December 24. 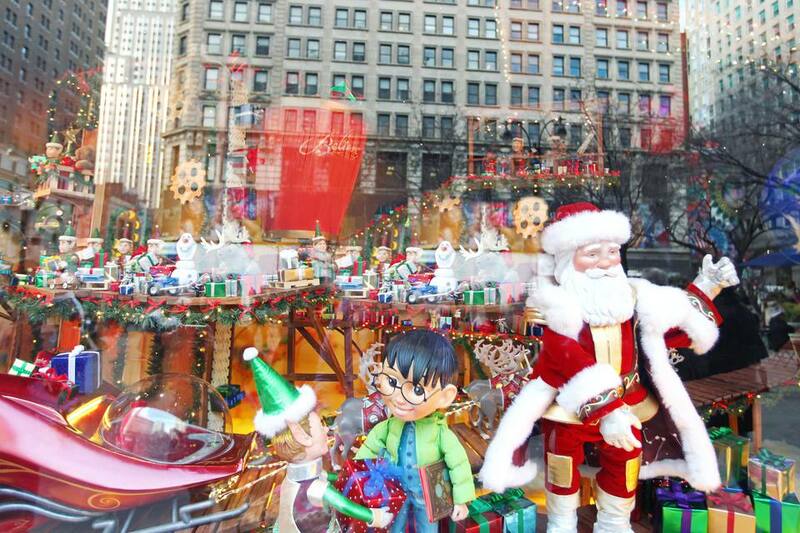 Santaland is at Macy's Herald Square in midtown on 34th Street between where Broadway meets 6th Avenue and 7th Avenue. You'll find the 13,000-square-foot Christmas Village on the 8th floor. You can enter Macy's on 34th Street at either Broadway or 7th Avenue, though the 7th Avenue entrance tends to be less chaotic. Macy's has an all-reservation system to see Santa​ in order to cut down on lines and wait times. Choose your reservation block from 30 minutes to 5 days in advance, depending on availability. Please note that while wait times are cut down with this new system, you should still expect to wait for a bit (around an hour) on busy weekends. It is expected to be less busy during the daytime on Mondays through Thursdays. Make your reservation online. It is free to reserve and to see Santa. When you make your reservation, you have the option to get a Santa Express Lane pass for Friday through Sunday. As long as time slots are available, you can go directly to see Santa when you arrive for your appointment rather than go through the village and scenery first. You will wait in a separate reservation line before visiting with Santa. Professional photos of the experience are not cheap. There is never any pressure to make a purchase, but the photo packages range from $20.99 to $59.99. The good news is that you can often ask an elf or assistant to take a photo with your phone and they will oblige. If you are interested in professional photos, you can see the picture on the display immediately after it's been taken. Normally they will take at least two pictures, but if you're not happy, speak up and they will probably do another. Take your ticket, and you'll go to the shop where you can purchase your pictures. You can choose from a variety of prints, Christmas ornaments or get your photo on a CD. Along with the souvenir photo (whether you pay for the package or have one taken on your phone), children will return home with a special keepsake from Santa to commemorate their visit. The magical experience begins with the viewing of the holiday window vignettes from Miracle on 34th Street and the boarding of the Macy's Santaland Express after the ticket window. As you walk through the train, you will feel rumbling from the "tracks" below. The elves will do their best to keep you moving along, but you can definitely take pictures of the displays and yourself in Santaland. You might even want to take a picture of your kids with Mrs. Claus. Travel through wintry villages and snowy scenery until you're greeted at the North Pole by Santa's elves. Marvel at igloos, ice sculptures, poinsettias, and lights, and then watch animatronic animals decorate a tree in the Enchanted Forest. Next, you'll approach the Rainbow Bridge and the massive Lionel Trains Industrial City display, complete with six train sets around a tree. Santa's Workshop is nearby, along with his sleigh, already loaded up with presents. Reindeer are relaxing in a stable right before the main event—Santa's home and your opportunity to meet the big guy.